I created these labels for a set of drawers in my Braille classroom. They include print labels, with Braille-inspired design elements for fun. I am going to laminate them and add real adhesive Braille so my students can have access to their materials. 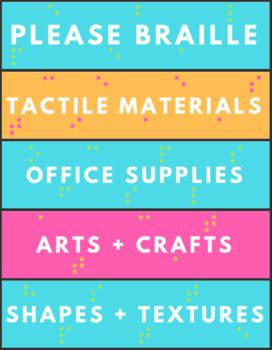 The "please Braille" label is for a bin I have on my desk, where other teachers and parents can simply drop off books and materials that they need Brailled.